While I was in Portsmouth I saw my first IMA sticker “in the wild”! (That is, a sticker I didn’t stick to something). 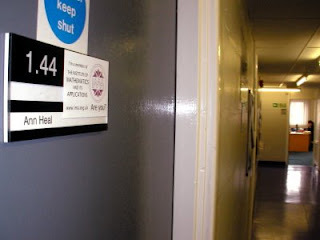 This was on the door of Ann Heal at the University of Portsmouth. And when I mentioned it to other people at Portsmouth they had noticed it, which is really great to hear. 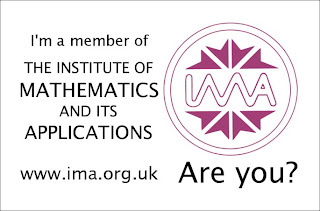 I designed a sticker to go out with Mathematics Today April declaring “I’m a member of the Institute of Mathematics and its Applications – Are you?” Unfortunately, due to an error the sticker was not included as intended in Mathematics Today April but instead we will be sending it out next week with a note of apology. IMA HQ and myself have received a good number of emails and phone calls about this; it is really gratifying to know that people are reading Mathematics Today and that there is a real interest in the stickers (though an unfortunate way to have to find out!). One emailer suggested it may be an April Fools Joke!